I love scallops. I especially love them breaded and fried but since I am trying to eat reasonably, I am having them pan seared tonight. The steamed new potatoes only take about twenty minutes to cook and, after they are done, I use the same pan to quickly sauté the snow peas. I mix up a small batch of Fish Market tartar sauce (secret ingredient yellow mustard) and my contributions to dinner are completed. 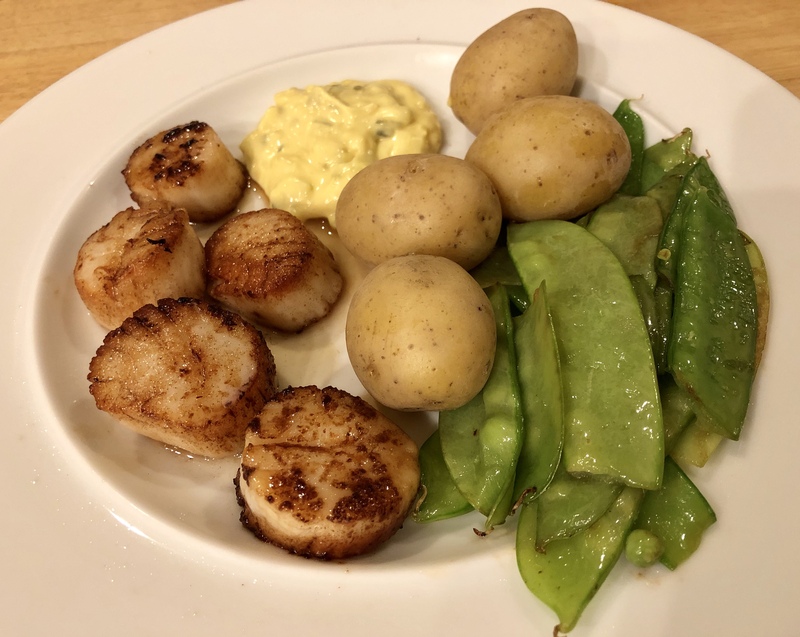 In the meantime John gets our cast iron frying pan ripping hot with a little vegetable oil and butter and quickly sears the scallops on each side for about one and a half minutes per side. Less than a half hour and we are totally done. This entry was posted in American, pescatarian, Shellfish, Vegetables and tagged new potatoes, scallops, snow peas. Bookmark the permalink.